My graduate work in English literature focused less on criticism than investigation, and my 1987 PhD dissertation was titled Literary Investigation: Texts, Sources, and "Factual" Substructs of Literature and Interpretation. I provided a solution to Ambrose Bierce's disappearance, discovered the 18th-century "missing" edition of The Sot-weed Factor, identified the real-life model for Hawthorne's "Veiled Lady" (in The Blythedale Romance), and so on. 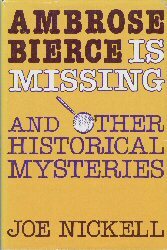 Much of this work was published in my book Ambrose Bierce Is Missing and Other Historical Mysteries, later retitled Unsolved History.